for social events after 6 p.m. The tuxedo is a very elegant suit and can be categorized as the nocturnal version of the Stresemann and one level below the tailcoat. The German expression for the tuxedo is “Smoking”, the British sometimes refer to it as “Dinner Jacket”. The jacket is longer than a usual suit’s and can be single- as well as double-breasted. It has no vent in the back, only one button in the front and can be found with peak-lapel as well as roll collar, usually made of silk or satin. The pants are made of the same fabric as the jacket, have one silk strap attached on the outside of each leg and are worn without a belt. The shirt is white, has a button-down front and double cuffs. 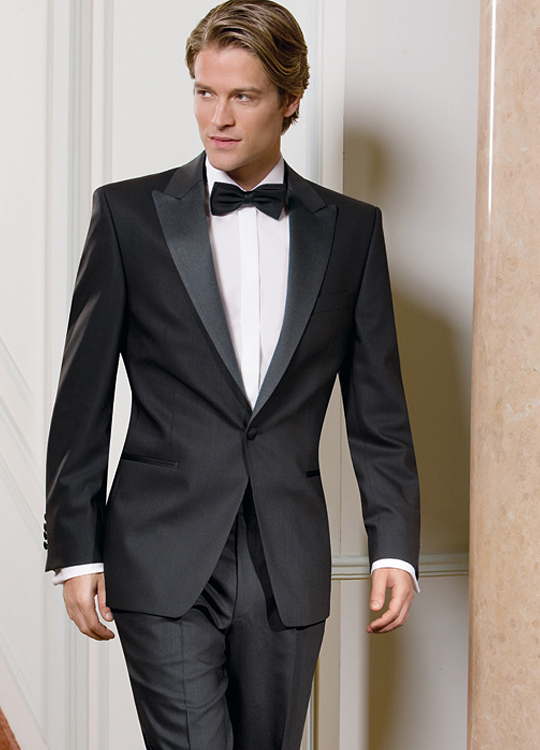 The tuxedo is accessorized with a black bow-tie and a black silk cummerbund, which conceals the waistband.